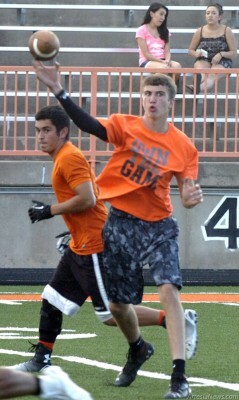 Artesia High School quarterback Justin Houghtaling finds his target during a passing game in July at Bulldog Bowl. The annual intermural scrimmage and Quarterback Club hamburger fry are time-honored traditions in the City of Champions. Their arrival means football season is just around the corner, and that never fails to send waves of excitement rippling through the community. To add to the buzz this year, Devon Energy Corporation has organized a community pep rally to immediately follow the scrimmage that will celebrate the start of the new sports seasons for all Artesia High School fall athletes. … For the rest of the story, subscribe in print and on the web.